A guide on multi-direction and multi-animation sprites? In YoYo Game Maker Studio: Is there a way (or an already-created library) I can specify all the possible sprite frames and directions in a way I am allowed to do it in Clickteam Fusion? 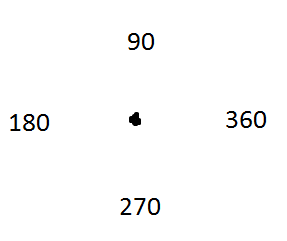 Meaning four frames per direction (left, right, up, down). Allow my sprite to have four directions. In such case, the animation will involve just the row corresponding to the direction. Is there an already supported way in the environment to do it? Like managing the related sprites as a set. Alternatively: Any good 3rd party plugin which already does that? I have no problem at all with coding the solution on my own, but honestly I would not like to reinvent the wheel. Make a new sprite, go to Edit Sprite then File→Create From Stripe... 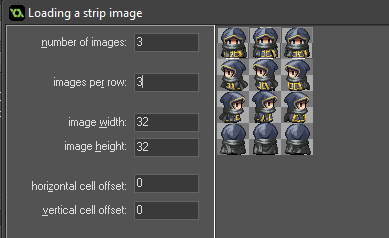 Pick your sprite sheet then it will show it with a grid. From there you can set number of images and images per row so that your llll are the 4 images for the left direction. You can make new sprites that have multiple images for the other directions, when the player is not moving, etc. Not the answer you're looking for? Browse other questions tagged game-maker or ask your own question.